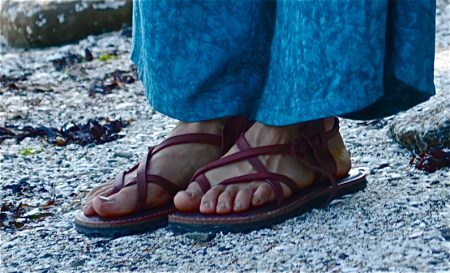 The Peaceful Warrior Leather Sandals are a classic, timeless design that has never gone out of style. The name is inspired by the ancient Desert Warriors of Northern Africa, who wore just such a strap sandal several thousand years ago in very demanding conditions. This ingenious strap design passes in between all major bones in the foot and toes and bypasses the instep, making it incredibly comfortable and suitable to many shapes of foot, size of bunyons, height of arch or instep. The advantage of a single continuous strap is that it is completely adjustable in all sections, even as the leather stretches, and holds the foot extremely well in any activity. No one has managed to improve this design in 3,000 years! Soul Path Shoes leather sandals offer the best of a time-tested design, modern materials and superior craftsmanship. 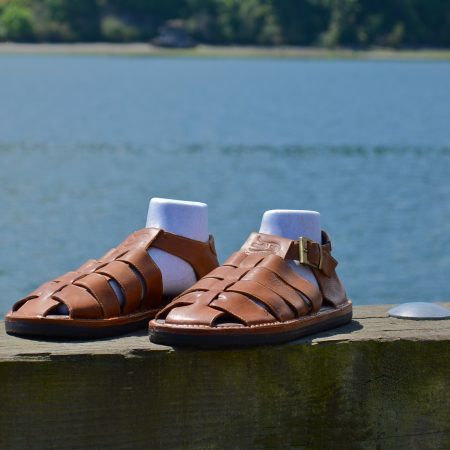 With a Vibram rubber outer sole, orthotic cushioning and premium leather these handmade sandals are of the highest degree of craftsmanship available today. Available in standard sizes for women, and custom sizing for both men & women.